Watercolors and crayons are so fun to play with! I'm always fascinated with the effect of the crayons resisting the paint. It's awesome! Step 1: Draw leaf outlines on your paper with crayon. You can look at a leaf or trace one to help you out. Then draw the veins inside each leaf. 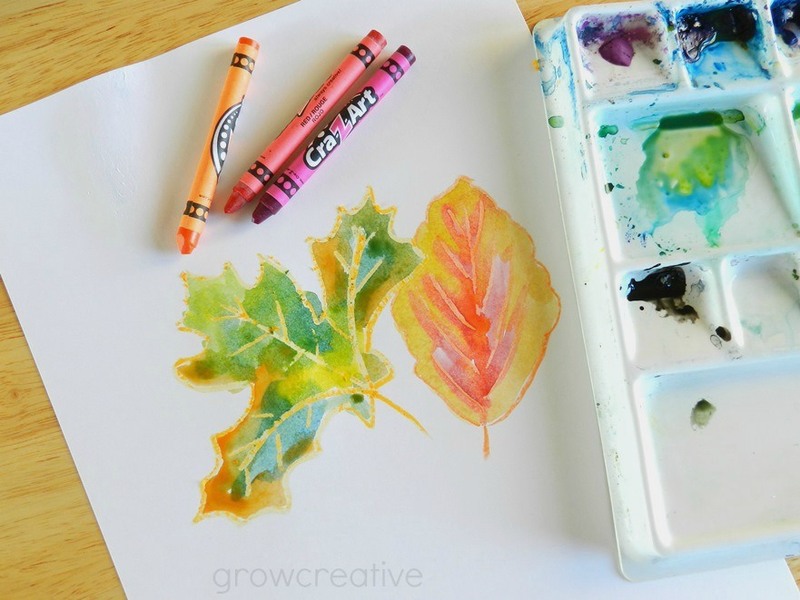 Step 2: With watercolors and a brush, paint the leaves with pretty fall looking colors. Try to stay inside the lines for this one, but you don't have to worry about being perfect here. Step 3: Let the paint dry and you are done! These are great! Love your painting tutorials! Oh wow, these are awesome! I adore watercolors, but I'm always too afraid to try anything. I think I'll do this with my girls this weekend. gorgeous! you make it look so easy....I doubt mine would turn out so nice! Beautiful! Younger kids could trace a lightly-printed leaf shape from the computer. This is so pretty! Pinned it. I love the creative ideas you come up with here.